Twelve years earlier, in 1959, he received a 10 year sentence for forging a stolen check. The sentence was suspended and Manson was given probation, but he continued a life of crime. Less than a year after his probation began, Manson violated the terms of his release and was charged with federal offenses relating to prostitution. His suspended sentence was revoked and he was ordered to serve ten years in federal prison. After exhausting his attempts at appeal, Manson arrived at the United States Penitentiary at McNeil Island, just west of Tacoma, Washington, in 1961. He would reside there, in Cell 2 of House 4, for the next five years before he was released. Later inmates who learned of Manson’s horrifying crimes and national infamy painted a pentagram on the cell floor. 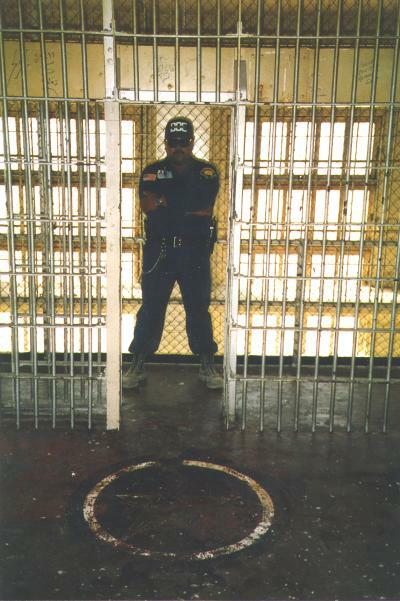 The photos are part of the McNeil Island Corrections Center Photograph Collection. This collection includes 809 photographic prints, 52 film negatives, 29 photomechanical prints, 1 photocopy and 7 inkjet prints created by the McNeil Island Corrections Center from 1855 to 2010.